Don Markstein's Toonopedia: Captain Marvel Jr.
one commercially important area, and that was in producing spin-offs. Cap was the first of the superheroes with an ancillary character who headed up a series of his own. In Whiz Comics #25 (December, 1941), when Fawcett had been in the comic book business just under two years, young Freddy Freeman was in a boat on a bay, fishing with his grandfather. A fight broke out between a couple of superheroes in the sky directly above, but one of them was a "hero" only in Germany, with which the U.S. was just then on the verge of going to war. The other, Captain Marvel, knocked the bad guy, Captain Nazi, unconscious. When the German plummetted into the water next to the Freemans' vessel, the latter, being decent human beings, rescued him. To repay them, Captain Nazi killed the old man and broke Freddy's back, crippling him for life. Later, the Nazi actually bragged to Hitler about the less-than-heroic deed. Captain Marvel rushed Freddy to the abandoned subway tunnel where he'd originally been powered up, and asked the ancient wizard, Shazam, to help. Just as Billy Batson gained the power of Captain Marvel (or switched back to Billy) by speaking Shazam's name, Shazam gave Freddy the ability to become Captain Marvel Jr. (or switch back) by speaking Captain Marvel's name. This not only made a superhero of the crippled boy — it also put a very odd and perhaps unique limitation on his power. He couldn't introduce himself to anyone, because as soon as Captain Marvel Jr. said the first two words of his own name, the magic lightning bolt would turn him back into Freddy. The following month, in Master Comics #22, both Marvels teamed up with Bulletman (who had been that title's cover feature up until then) to settle Captain Nazi's hash. Once that was taken care of, Junior became the lead feature of Master Comics, pushing Bulletman into the back pages. Orphaned as well as crippled, Freddy made his living by running a newsstand. In addition to his monthly appearances in Master Comics, as of November, 1942, he was published in a title of his own. Before launching the character, Fawcett editors had made a decision not to make him a simple duplicate of their best-selling hero. That's why Junior's costume was blue instead of red; but more important, that's why he was drawn in an illustrative style rather than the cartoony one C.C. Beck was using on the original. Emanuel "Mac" Raboy, whose fine-lined figure work had earlier been seen on The Green Lama for Prize Comics and Doctor Voodoo for Fawcett, collaborated with Beck on the origin story, then handled Junior on his own once the regular series started. Other artists drew the young hero later on, but it was Raboy who set the tone. Raboy is best remembered for his work on Flash Gordon. The first few stories were scripted by editor France Herron, who later spent decades at DC Comics. In the 1940s, Herron scripted Vigilante, in the '50s he did Batman and Tomahawk, and in the '60s he co-created Animal Man. 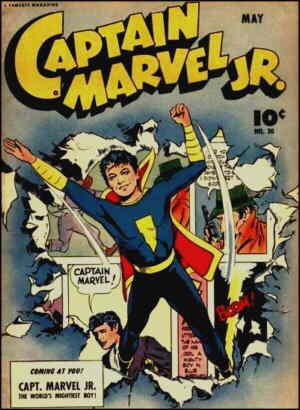 Captain Marvel Jr. was probably the only character of the 1940s to appear as a member of two separate superhero teams. In Master Comics #41 (August, 1943), he got together with the other denizens of that title (Bulletman, Bulletgirl and Minute Man), who collectively called themselves "The Crime Crusaders Club" (no relation). The 13-page story in which that happened is the club's only appearance, and it was never even mentioned elsewhere — including the issue's cover. In fact, it can scarcely be thought of as having existed at all, except as an odd little footnote in comics history to be seized on by latter-day fans, eager to connect all the characters together. More notably, starting in 1945, Junior, Cap and Cap's sister (and second major spin-off) Mary Marvel, became part of a regular series called The Marvel Family, which continued for years. Even tho he was only a second-string hero, of sorts, Captain Marvel Jr. was one of the most successful superheroes of the 1940s. Both his Master Comics series and his own comic lasted until 1953, and his final appearance altogether was in Marvel Family #89 (January, 1954). He might have run longer yet, if Fawcett hadn't finally, after years of litigation in which it was claimed the first Captain Marvel was a rip-off of Superman, given up and gotten out of the comic book business. Years later, it was Superman's publisher, DC, that brought the whole Captain Marvel entourage back. Starting in 1973, DC licensed the Fawcett characters, buying them outright a few years later. Junior was part of the crew, and a prominent element of DC's Shazam! series until it folded in 1978. It was during this period that DC retconned Kid Eternity (who also had an origin that involved a grandfather being killed at sea by Nazis) into Freddy's brother, separated from him at an early age. That scenario doesn't seem to be a canonical part of DC Universe continuity anymore, but for a time it tied that Quality Comics character in with the Marvels. DC still owns the old Fawcett superheroes, and still revives Captain Marvel and crew from time to time. That company sometimes does variations on the basic Captain Marvel theme, but Freddy Freeman, the crippled newsboy who became Captain Marvel Jr., is usually a part of it.